AHEM, we have some rather exciting news. This coming Friday September 15th, we will be releasing a new product! The ABG in its element. Our Alberta Botanical Gin is a spirit made entirely from ingredients sourced within this wonderful province. 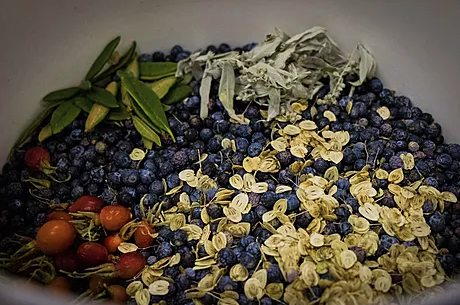 Traditional gin's use ingredients that are internationally sourced. As you can imagine, botanicals such as lemon peel, orange peel, cassia bark and coriander seed to name a few, are not indigenous to Alberta. So what we have done at WLD is create a completely novel spirit, using 100% AB ingredients - right down the the base spirit. We're not talking 'we put mostly local stuff in there'; we mean Every. Single. Ingredient. And we think that's pretty darn neat. As we learn more and more about the alcoholic beverage industry as a whole, the amount of smoke & mirrors surrounding many claims to product greatness have become overwhelmingly obvious to us. Hence the opportunity to put out a product as unique as this just had to be seized. In mid-August the #WLDboys went foraging foragin. Get it.? We met with an edible plant expert/naturalist in the foothills of Alberta and spent the day exploring and gathering aromatic, edible plants to help us create this AB gin. The result is an expression of what the land had to offer on that day, combined with the beautiful base spirit that embodies our classic WLD vodka. 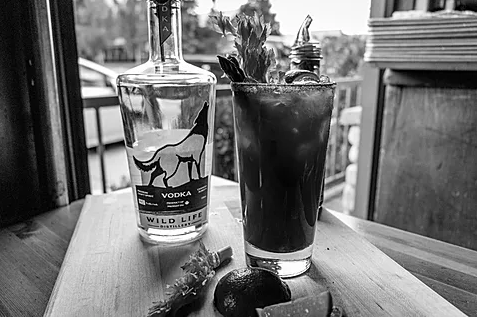 Rocky Mountain juniper, wild silver sage, Labrador tea, wild rose hip and cow parsnip are but a few of the foraged botanicals in the recipe. We produced 360 bottles of this unique product, and they will only be available for sale at the distillery. Free tasters and drink specials will be on all day long. Tasty Valbella eats will be provided from 6pm-8pm. Bring a friend! We hope to see all of you down here on Friday! We will have this gin on sale at WLD until it's gone, and then it won't be until next year before we can harvest many of the herbs that we used in its making! So get it while the gettin's good. In other news.. We're hiring! We are looking for a young, energetic distiller who is interested in the WLD way of life (basically working all the time.. ;) kidding). Previous distilling or brewing experience is an asset, however any skilled trade experience would also be highly useful. If you or someone you know is keen, hardworking and willing to learn as well as teach, please get in touch. One full time position is available. Email info@wildlifedistillery.ca with any interest or for more info! Lastly, we have had so much support in the Bow Valley this summer that a quick thank you is in order! Local people, local establishments and local engagement is what makes this craft distillery thing work. We have been overwhelmed with the support we've received in the last 8 months and owe it to all of you and the many local businesses in town that either sell or pour our spirits. WLD Caesar at Rocky Mountain Flatbread Co. Notably Canmore's Rocky Mountain Flatbread Co has been one of our best supporters. We are the only vodka AND gin that they carry in their restaurant! Further, if you are eating there any time soon, be sure to save your receipt as there is a coupon on the bottom for a free tour/tasting here at the distillery! Once again, thank you... As we roll into fall, there are lots of exciting projects on the horizon. But for now, its ABG and one foot in front of the other.